The Black-necked Stork, Ephippiorhynchus asiaticus, is a large wading bird in the stork family Ciconiidae. It is a widespread species, which is a resident breeder in southern Asia and Australasia, from India east to New Guinea and the northern half of Australia. 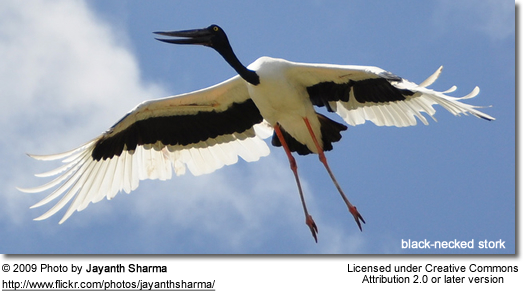 In Australia, it is also known as a Jabiru but should not be confused with the similar bird of this name from the Americas, which belongs to a different genus. The only stork in Australia, this species is considered as endangered there. The Black-necked Storks are extremely sensitive to environmental changes like water pollution, habitat destruction and human disruption around breeding sites. It is evaluated as Near Threatened on the IUCN Red List of Threatened Species. 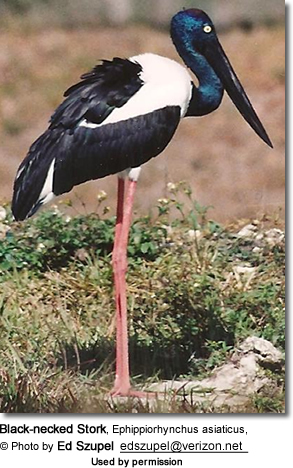 The Black-necked Stork is a huge bird, typically 130-150 cm tall with a 230cm wingspan. It is spectacularly plumaged. The head, neck, wing bar and tail are jet black, with the rest of the plumage white. The massive bill is black and the legs are bright red. Sexes are identical except that the female has a yellow iris, while the male's is brown. Juveniles are mainly light brown with a white belly and dark legs. Like most storks, the Black-necked Stork flies with the neck outstretched, not retracted like a heron. The Black-necked Stork breeds in marshes and other wetlands in tropical lowland. It builds a stick nest in trees, laying three to five eggs. It often forms small colonies. The diet consists mainly of fish, frogs and large insects. Young birds, lizards and rodents also taken.